Photos courtesy of my friend Kimberly of Frontierland Station. The Gingerbread Houses - Every year the chef's at Disney build huge gingerbread houses in the lobbies of several Deluxe Resorts. In 2014 Disney's Contemporary Resort featured a Frozen themed house with Anna, Elsa, Olaf, Kristoff and Sven. 2015 will mark the 17th year that Disney's Grand Floridian has housed a life size grand masterpiece. It is 16 feet high and has 40 window panes, and is made with 1050 pounds of honey, 700 pounds of chocolate, 600 pounds of confectioner's sugar, 35 pounds of spices, 800 pounds of flour, 140 pints of egg whites and 180 pounds of apricot glaze!! You can even buy make your own kits to take home with you! A tour of these amazing gingerbread houses will definitely be on my "must do" list! Characters Dressed for the Holidays - You get to see Mickey and Minnie in their festive holiday finery and perhaps even in Santa and Mrs. Claus attire (not to mention the Santa himself), Goofy and Donald don their hats and scarves and wintertime sweaters, you get the idea. They are all so adorable in the seasonal attire, and it's the only time of the year you can see them dressed that way. Holidays Around The World at Epcot - There is no better time to tour the World Showcase than during the holidays! November 27-December 30 are the 2015 dates for this amazing event. Visit Santa and Mrs. Claus and enjoy the Voices of Dickens Carolers in American Adventure. Go on a musical tour of the Great White North with Canadian Holiday Voyageurs, and watch the Chinese Lion Dance which is said to bring good fortune and happiness. In France experience the joy of the Christmas season through a child's letter and meet Pere Noel. Helga tells you the story of the first Christmas tree in Germany and meet La Befana, a good-hearted witch from Italy, who grants gifts to children on the eve of the Epiphany. Listen to the story of the Daruma Doll and learn about Japans New Year's customs and of course there's Feliz Navidad festivities in Mexico. Celebrate the spice of life in Morocco, learn about Julenissen, the Christmas Gnome from Sigrid in Norway. Father Christmas will be waiting for you in the United Kingdom with tales that date back to 15th century England. Candlelight Processional - This celebrity narrated telling of the Christmas Story in Epcot is a Disney fan favorite. As a celebrity narrator recounts the story of a baby born in a manager, orchestra and choir performances are masterfully woven in to make this a truly inspiring event. There is a dinner package available for guaranteed seating, all other seats are on a first-come, first-served basis. Seasonal Treats - Gingerbread Mickeys, specialty candy apples, peppermint bark, chocolate-peppermint cheesecake cupcakes (yum! ), gingerbread cupcakes, specially decorated Mickey rice krispy treats! I could go on and on about all these and the pumpkin cheesecake fudge or peppermint fudge. Come prepared to try treats you can only get during the holiday season - can you say snack credit?? Osbourne Family Spectacle of Dancing Lights - Since it began in 1995 this has been a perennial favorite of Disney fans. Millions of multi-colored lights transform the buildings in Hollywood Studios into a sight you have to see to believe. There are twirling carousels, toy soldiers, even Santa and his reindeer. You have to see it to believe it, and to think it started as a family's personal outdoor display. Disney's Holiday D-Lights - This 5-hour tour starts in Epcot where you will enjoy the Candlelight Processional. Then you're off to Hollywood Studios where you will stroll throughout the Osbourne Family Spectacle of Dancing Lights where you are mesmerized by literally millions of twinkling lights all choreographed to music. 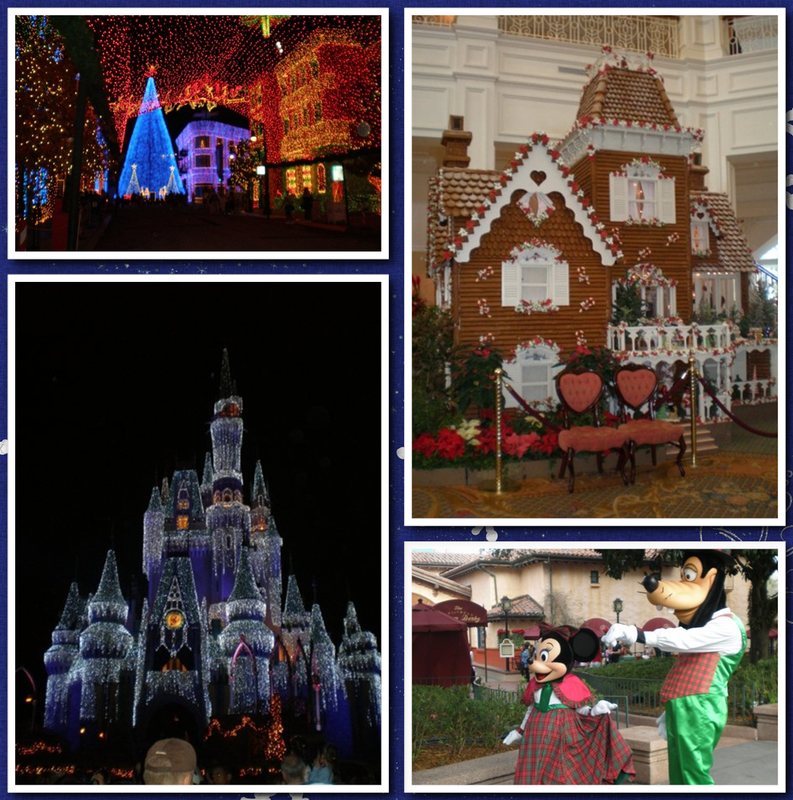 Then you will be whisked away to Magic Kingdom to see Main Street all decked out for the holidays and experience the beauty of Cinderella Castle transformed into an ice castle for the holidays. Finally, you will meet the talented team behind creating this magicalwinter wonderland and enjoy a light buffet of holiday foods. There is an additional charge for this tour, all guests much be at least 16 years of age. All guest who participate will receive a limited-edition Disney Pin. The Decorations - The Mickey shaped wreaths hanging from garland on Main Street, the multi colored lights that illuminate from seemingly everywhere after dark, the gorgeous decorated trees that are on every corner. They all add even more magic to Disney during the holidays, and that's not easy to do! From the resort lobbies to the lamp posts to the store windows all of Disney is transformed into a Magical Winter Wonderland during the holidays. Mickey's Very Merry Christmas Party - Watch as Fairy Godmother magically lights up the castle as a gift for Cinderella (and all of us), experience meet and greets with your favorite characters (and Santa), enjoy Mickey's Once Upon a Christmastime Parade, Holiday Wishes fireworks, Celebrate the Season Show and A Totally Tomorrowland Christmas! Snack on free cookies and hot cocoa...and it SNOWS on Main Street!! This event does require a ticket and there is an additional charge. You're ready to pack your bags and go with me now, aren't you? Don't worry - I can help you get there too! Email me at donnakay@thewdwguru.com or call me at 877-825-1646 ext 706 and let's start planning your Magical Christmastime Vacation today! !